Out of the 100 billion stars in our galaxy, 20 billion have planets that could potentially sustain life. Aliens. They may be more likely than you think. We all sort of hoped that they might be "out there" somewhere in the galaxy, and now NASA astronomers have estimated that as many as 20 billion of the 100 billion stars in our galaxy have planets that could potentially sustain life. 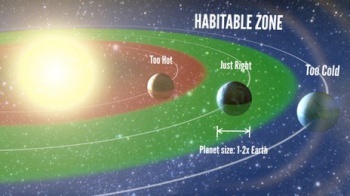 Using data from NASA's Kepler space telescope they argue that one in five stars like the Sun hosts an Earth-sized world located in the "habitable zone". The "habitable zone" describes the region around a star where temperatures allow for water to stay liquid at the surface, and we all know that water is the key building block of life. "What this means is, when you look up at the thousands of stars in the night sky, the nearest Sun-like star with an Earth-size planet in its habitable zone is probably only 12 light years away and can be seen with the naked eye," said the co-author of the study, Erik Petigura, from the University of California, Berkeley. While this is some pretty amazing news, other team members cautioned that just because planets exist in the habitable zone, does not mean that they are automatically hospitable to life. "Some may have thick atmospheres, making it so hot at the surface that DNA-like molecules would not survive," said another author, Geoff Marcy. Researchers came to this conclusion by first gathering data by combing through some 42,000 stars to find habitable planets, and then extrapolating the data to apply to the entire Milky Way galaxy.